A good social club / pub sort of place with (at time of review) Fullers Two Halves on and also doing tasty food e.g. steak sandwich, all day breakfast, Sunday roast. Like the rooftop terrace. It's like being abroad on holiday only with decent beer. Moved into new smarter larger premises in Alison Street.Three ales on sale .Late opening weekends. Mind you that was a couple of months back before the 'refurb' but I'm not holding my hopes up. Just to clear up; extortionate prices, foul tasting lager, surly bar staff, deafening music, horrible experience all round. Went here on Saturday 14th. Refurb has made this place look awesome, unfortunately they forgot to include a dance floor! Outside seating brill for smokers, and upstairs area open for a relaxing drink. We paid �3 to get in as entry charged after certain time. 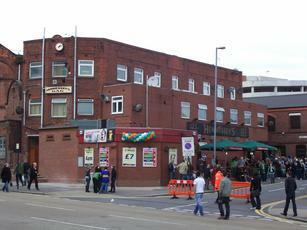 If you remember this place how it was you might be disapointed as run down hennesseys was wkd. Try for yourself.